To the best of my knowledge, both Squier and Fender Stratocasters come equipped from the factory with .009 to .042 gauge strings, which is considered to be "extra light" or "super light" as far as string weight is concerned. In my experience I find that the best string for a Strat is one that has nickel content in it. That type of metal brings out a brightness in the Stratocaster that other strings don't. These are the brands I recommend, all in .009 to .042, and why I like them. Each string below is linked, so if you want more info, just click the link for it. D'Addario EXL120 - You basically can't go wrong with a set of these. They suit the Strat very well, keep their brightness for a good long while and they're always available. Even if you prefer another brand over this one, this should be your "backup brand" just in case the kind you normally buy are out of stock. Dean Markley NickelSteel Electric - Whenever I see these, I buy them because they usually go out of stock quickly. One of the best-kept secrets for Strats as far as I'm concerned. DR Strings Tite-Fit LT-9 - Don't let the plain packaging fool you, because these are great for Strats. They require a longer break-in time, but it's worth it. 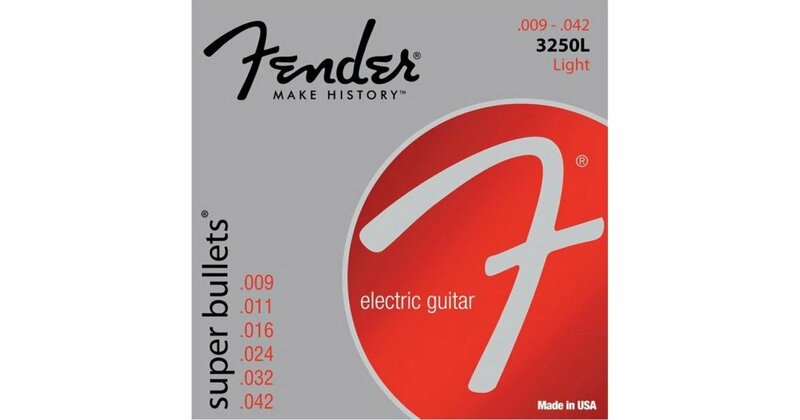 Fender Super Bullets 3250L - Fantastic string, with the only drawback being they lose brightness fairly quickly, so if you don't change strings often, you probably wouldn't like these. But if you do change your strings out frequently, you'll like the bullets. Why didn't I mention Ernie Ball Super Slinky's? Everyone's familiar with the 2223, as in "the pink one", and I've tried them off and on over the years, but the result is always the same for my playing style - SNAP! Busted string. Usually the 2 (B) string. If you like EB 2223's, that's fine, but I can't recommend them based on my experience. I purposely use strings that aren't "special" in any way, like cryogenic-treated (frozen during manufacturing process) or coated strings or any of that other stuff because it doesn't really add anything to my sound. The only thing I see with those special strings is a higher price tag and not too much else. "I want a guitar string that lasts for years"
The only people who say this are usually guitar collectors that don't play their guitars very often. Otherwise, no matter what brand of string you go with, you're going to change them out at least once every few weeks. Guitars are machines, and machines need maintenance, so you will have to go through the chore of changing strings out every once in a while. That's just the way it is. You'll notice that there are some strings for sale that are "pure nickel". You might think these will make for a super-bright tone, but that's not what you'll get. All-nickel strings have a significantly mellower tone to them, which is why I recommended the strings above that are a combination of nickel and steel. If you like a mellower sound to your strings (maybe for jazz? ), then by all means go for it. This is the only instance where I do recommend EB strings. In particular, the heavier 10-gauge set Ernie Ball 2251. Saddle heights for 9-gauge are not the same for 10-gauge and vice versa. This even counts if you decide to go with a "heavy bottom, light top" set such as .009 to .046. The adjustments you need to make are minor if you switch gauges, but just remember you will have to do it.